Punahou wide receiver River Kim tried to escape the grasps of Iolani defenders Landon Patoc and Daniel Takami. Just hold onto the ball. It's what players are told time and time again when their team has possession and is driving for a last-minute score to win a game. Unfortunately, it came down to a fumble by Iolani quarterback Kiran Kepoo as his team was heading toward a possible game-winning touchdown that allowed No. 4 Punahou to hold onto the 24-20 victory in an Interscholastic League of Honolulu contest at the seventh-ranked Raiders' Kozuki Stadium yesterday afternoon. 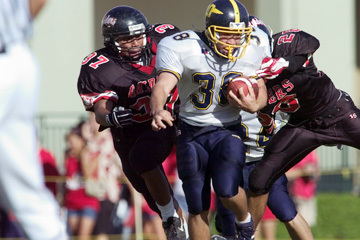 "We're always scared when we're playing Iolani," said Punahou head coach Kale Ane. "They're well-coached, and they make adjustments when they have to (so) we're very pleased to get the win." The Buffanblu (7-2, 4-2 ILH) kept the ball on the ground, as they nursed the four-point lead in the waning minutes of the final quarter and ran the clock down to 1:01. After a missed field goal off the foot of Punahou's River Kim, Iolani got the ball on its own 20, in need of an 80-yard touchdown drive for the win. Kepoo completed passes of 5 yards to Blayne Yama and 15 yards to Kekai Kealoha to move the ball to the Raider 40-yard line. But, after running up the middle of the field for 12 yards, Kepoo fumbled the ball, and the Buffanblu recovered on their own 46-yard line, effectively giving Punahou the victory as Buffanblu quarterback Brett Kan took a knee and ran out the clock. "I'm glad we don't have to play him again," Ane said about Kepoo. "He's a great quarterback, and I'm sure he'll be all-league this year. Every time he throws the ball or scrambles, he's a threat." The Raider gunslinger finished the game with 247 yards on 17 completions and no interceptions. Punahou opened the scoring with a 25-yard field goal by Kim at 6:53 in the first quarter. Iolani came right back with a scoring drive of its own. Running back Mike Hirokawa rushed for a 5-yard touchdown after being set up nicely by a 35-yard pass from Kepoo to Kealoha. A Kody Adams extra point put Iolani up 7-3 with 2:39 to play in the first quarter. Punahou answered on its next drive as Kainoa Carlson ran for 38 yards to put his team on the Iolani 6-yard line. After completing a 5-yard pass to Miah Ostrowski, Kan punched it in from a few inches out for the touchdown. Kim's extra point was good, giving Punahou a 10-7 advantage with 10:34 to play in the second quarter. "The running game came through when we needed it," Ane said. "We like to pass the ball more, but we felt we had to establish the run to open up the receivers. The line did a great job and the runners ran hard." After both teams forced punts again, Iolani returned the ball to its own 42-yard line. The Raiders drove down to the Punahou 14, but the Buffanblu defensive unit held strong and forced Iolani's Adams to convert a 30-yard field goal with 2:42 remaining in the first half. The score stood even at 10 apiece. On the ensuing drive, Iolani (6-4, 3-3 ILH) sacked Kan on both second and third down, forcing Punahou to punt, giving the Raiders great field position at their own 40-yard line. After a 5-yard false-start penalty and an incomplete pass, Kepoo threw a 65-yard touchdown bomb to Travis Nishioka, electrifying the homecoming-game crowd. The successful extra point put Iolani ahead 17-10 with 43 seconds to go in the half. Iolani received the kickoff to open the second half, but could not keep the offensive engine running. Punahou received the punt on its own 32-yard line. After Carlson and running back Ryan Nobriga helped the Buffanblu move the chains, a 28-yard pass from Kan to Zac Yamagishi in the corner of the end zone gave Punahou a momentum-shifting touchdown as the Buffanblu tied the score at 17. On Iolani's next drive, it was forced to punt, and a high snap to punter Jon Takamura resulted in a 21-yard loss and gave Punahou the ball on the Iolani 39-yard line. After the offensive unit marched to the 2-yard line, Nobriga busted through a wall of defenders for the touchdown, putting the Buffanblu up for good at 24-17.